Casa Liza... Villas en el Parque is an elegant enclave of luxurious and romantic accommodations situated on the paradise-like grounds of an in-town restored colonial estate three blocks from the center of town. Fountains, fireplaces, antique furnishings, original art and sculpture by local artists. Lush grounds with parrots and orchid-filled greenhouse. Sumptuous gourmet breakfast, when and where you like even in bed. Cable TV and telephone in all accommodations. 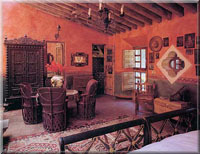 Enjoy the warmth of traditional Mexican Colonial architecture, comfortable and quiet bedroom suites each with access to outdoor living areas and patios, plus a uniquely personal environment created by Casa de la Cuesta's fine collection of Mexican folk art, crafts and antiques. 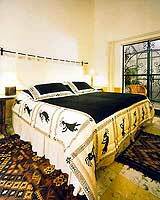 Choose between one of Casa de la Cuesta B&B's six special rooms, each with its own artistic folk art theme. 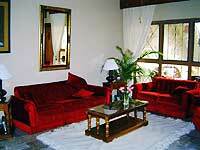 Our personal attention and pleasant atmosphere makes Casa de la Cuesta one of San Miguel's favorite destinations. Housed in a gorgeous, fully-restored 18th Century mansion, just three blocks from the town square, Villa Scorpio has five luxury guest suites with private bath, and a on-site day spa for massages, facials, reflexology and more. Enjoy homemade Breakfasts daily, elegant common areas, flower-filled fountains, serene garden patios and a spectacular view of San Miguel de Allende from the rooftop terrace. All rooms have down comforters, gas fireplaces and electric fans, plenty of fresh purified water, hand-painted tiled baths and complimentary flowers. We look forward to meeting you and welcoming you to our wonderful town! 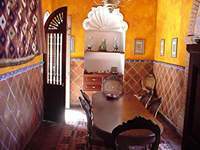 This glorious Bed & Breakfast is set in a magnificently restored 300 year old Spanish colonial home, using many wonderful Mexican antiques. The owner, Gerry Gill, has given Casa Granada the genuine spirit of the artist that she is with an incredible attention to detail. 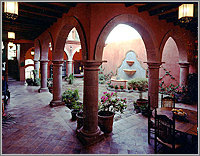 It is a favorite of the house and garden tour, located in the heart of San Miguel's historic district. 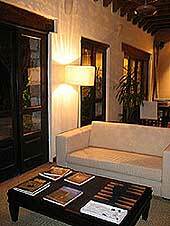 Casa Calderoni Bed and Breakfast, located in San Miguel's historic center combines the intimacy of an elegant Bed and Breakfast with the luxuries of a small boutique hotel. Our Bed and Breakfast offers its guests nine elegant and unique artist themed suites, each with a private bath, cable television, and telephone. It's located just 3 blocks from the town square, and is conveniently located just one half block from the world famous "Mercado de Artesanias", featuring fine Mexican handicrafts from all over Mexico. La Casita de las Flores is San Miguel's charming "B&K" (Bed and Kitchen) ï¿½ a comfortable and affordable alternative to expensive hotels and B&B's. La Casita offers five lovely private rooms in a courtyard setting, two full shared bathrooms, a complete kitchen, and a sunny, flower-filled patio ï¿½ all just a 20 minute stroll from the historic centro. We don't provide breakfast, but you can use the kitchen any time. Weekly maid service is included. Note: Casita access is by appointment only. Please give us a call if you'd like to visit! "...one of the world's most fabulous unknown hotels." "...the best B&B outside of the US." Welcome to Casa Luna, an oasis in the heart of town, only 2-1/2 blocks from the Jardin with shopping and restaurants just steps outside the front door. Each of the nine beautiful guest rooms is uniquely decorated with antiques and folk art, fireplace, private bathroom with tub, shower, on-tap purified water, and beds which can be made up as either one king or two twins. 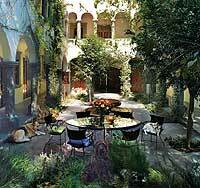 Most have private patios attached. 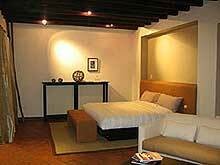 Casa de la Merced offers two well-appointed suites, both located on the ground floor. 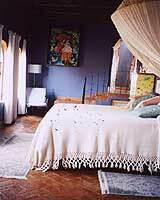 Each room has high wood-beamed ceilings, thick walls and columns finished in the Mudejar style. Beautiful tiles dress its kitchens and bathrooms, while walls are painted in warm agreeable colors and inner terraces are lit by natural light. 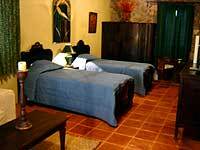 La Casa de la Merced, is more than a bed and breakfast -- each suite has a kitchen, dining room, living room, bath, as well as a bedroom with cable TV, and an inner terrace. If you are looking for a home away from home, a place where you can invite your friends, La Casa de la Merced, is the place for you. Located in a residential area with watchman. Guests enjoy the opportunity to practice Spanish with a family of professionals. 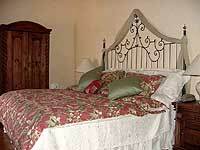 Very reasonable rates include delicious home-cooked meals. 6 Bedrooms with private baths. View of the cupolas and steeples of downtown from bedroom windows and terrace. 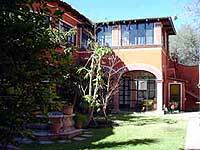 Casa de Sueños is located near the heart of San Miguel 1/2 block from the Instituto Allende. 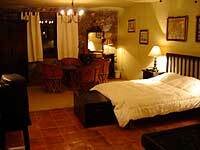 There are two guests rooms, each with their own large private bathroom and gardened terrace. The Emerald Room is furnished with a queen size bed, writing desk with a nice view of the upstairs garden and ample closet and dresser space. The Blue Room is larger, also with queen size bed, more than ample closet and dresser, and a humongous water closet with a separate bathroom and shower. The bathroom connects to a spectacular private terrace with a table, umbrella and lounge chairs. 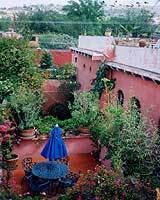 Casa Puesta del Sol is a Villa, located on the side of the hill, overlooking San Miguel de Allende. Nestled among the most prestigious homes in the neighborhood of Atascadero, this unique Bed and Breakfast offers the most modern amenities with old world charm. Casa Puesta del Sol, "The Sunset House" provides a one-of-a-kind setting for your special retreat, vacation, fiesta or wedding with beautifully landscaped gardens, Koi ponds and a spectacular view of San Miguel de Allende and the valley beyond. A friendly staff of maids, cooks and 24-hour groundskeeper are here to attend to your needs. With its sweeping views and breathtaking sunsets, the Sunset House offers an experience you'll never forget. REYNA'S B & B... 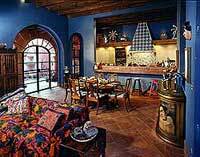 Your gourmet home in San Miguel de Allende. 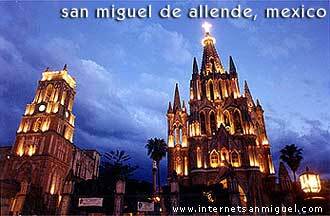 A unique place for a delicious gastronomic experience in beautiful San Miguel de Allende, Guanajuato. 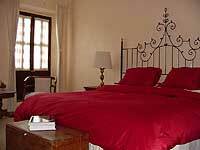 A very cozy and intimate B&B with a five-star culinary kitchen for vegetarians, vegans and meat lovers. 5 rooms for one to four people. Includes breakfast and lunch. Located just three streets from the main square, in the heart of San Miguel de Allende, Guanajuato, DOS CASAS Luxury Bed and Breakfast is an exclusive and refined Mexican home offering just five rooms for those who enjoy the "good life". At DOS CASAS, one can choose from a luxury room, spacious suites, or our room with its own Jacuzzi, sauna and private terrace, or even the entire home for the exclusive use of you and your group. Located in San Miguel de Allende, Guanajuato, the heart of Mexico, La Casa de Elvia is a warm and inviting typical Mexican home where the courtyard and surrounding areas painted in terracotta colors are filled with bougainvilleas and other colorful aromatic plants. 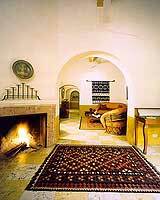 Our rooms are uniquely decorated featuring original handicrafts, some of them with kitchenettes, fireplaces and full bath. Find about our SPA treatments and Cultural Programs. 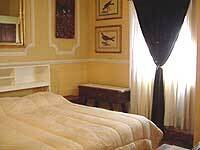 $30 USD per person with a minimum of 3 day stay, $15 USD per additional person. 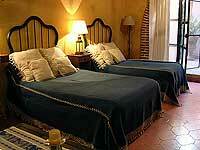 "Casa de la O" Bed and Breakfast is located just 3 Blocks from the "El Jardin" - San Miguel de Allende's main square. Casa de la O offers a 6 Rooms and 4 apartaments in a colonial home, each with their own bathroom, and a large and beautiful garden. Casa de la O permits smokers, children and pets are welcome. After only a few minutes walk from the Jardï¿½n guests enter a sanctuary of luxury and tranquility: Casa Misión de San Miguel. This new bed and breakfast, modeled after the "Paradors" of Spain, offers not only lovingly decorated, spacious rooms and a large rooftop terrace but also free internet and long-distance telephone service to the U.S. and Canada, in-house massage, cooking, yoga, dance and personal training classes and an ambiance that invites guests to relax and revel in the romance of Old Mexico. Casa Misión is the perfect venue for small to medium-sized weddings and other events. from San Miguel de Allende's jardin and right in front of Instituto Allende, one of the best art schools Mexico has. home but with affordable prices. 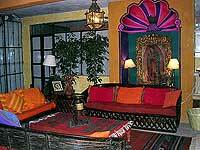 We also have one of the most exquisite restaurants that offers a fine selection of international cuisine and wine.